As a habitant of frigid USDA garden zone 5a (a small warm pocket just south of Minneapolis) it pays to overwinter tropical plants to enhance our butterfly garden. The same could be said for most gardeners located below USDA hardiness zone 8. Our goal for overwintering mature tropical plants is to achieve slow growth with superior health. These plants will give our butterfly garden a huge head start when they are replanted next spring. You can do this too! The only reason to leave lots of foliage on overwintering plants is if you want to give unwelcome garden pests a good place to hide. I cut back most plants, including tropical milkweed, to about a foot. It’s a lot easier (and less messy)to clean the grime off pots before you take them inside. I was a fool who believed that after our plants were cut back (with no bugs in sight) they would remain pest-free for the winter. Little did I know that fungus gnat eggs, hiding under the soil, were about to hatch an alternative plan. By the time I realized these gnarly gnats had invaded our basement, they were already a major problem, killing two of our smaller tropical plants. The next season, I treated all our plants with hydrogen peroxide (H2O2) to prevent this issue. H2O2 kills gnat larvae on contact. 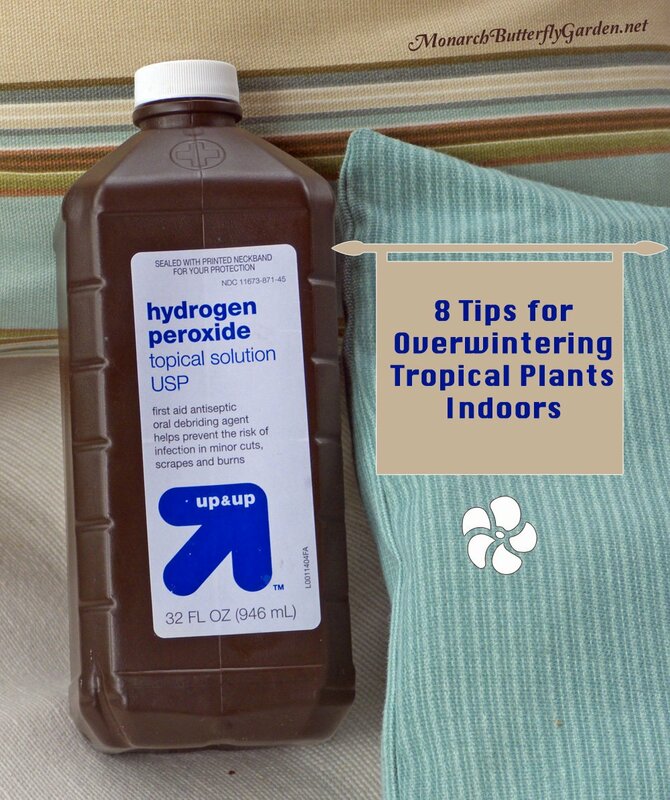 Hydrogen peroxide also helps your plants grow by putting more oxygen into the soil. Many plant diseases and fungus are the result of low oxygen levels in the roots. The extra oxygen molecule (O2) in the soil will help prevent root rot. Spraying also raises the humidity level for optimal plant growth. tip: Water the container plants with hydrogen peroxide just before you bring them in and throughout the winter. This keeps dirty water from potentially soiling your floors or creating slip hazards. In past seasons I have only used natural window lighting on plants. This has worked well for tropical milkweed and most plants. 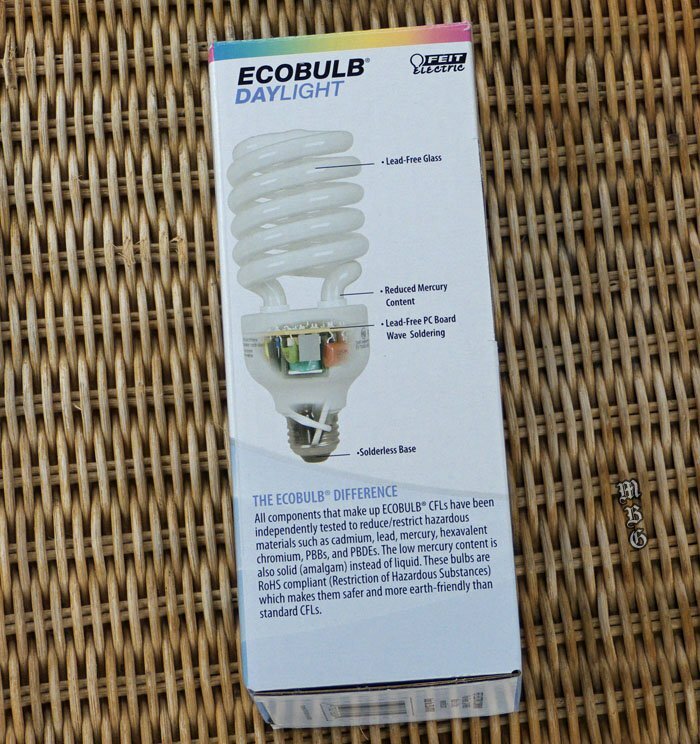 Now I use additional light sources in the form of CFL (compact fluorescent) light bulbs. I’m using two 40 watt bulbs (each equivalent to a 200 watt regular bulb) and a 25 watt bulb (equivalent to a 100 watt bulb). I am using full spectrum bulbs that simulate natural daylight. The plants get approximately 10 hours of light each day. 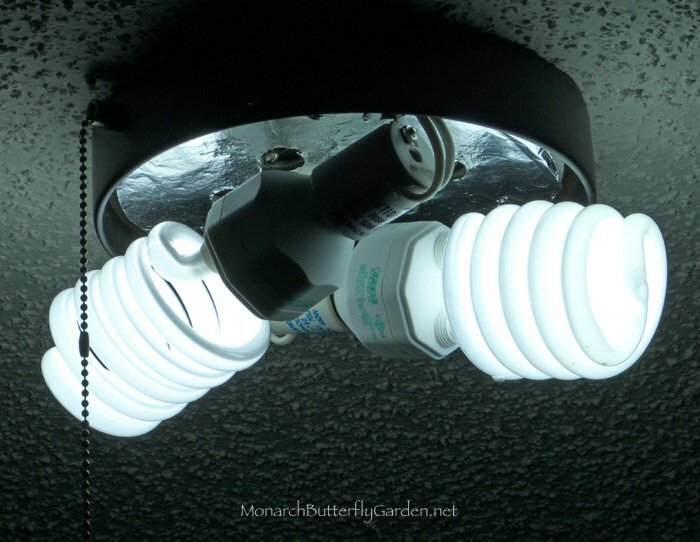 You should be able to find these bulbs at big box stores like Lowe’s or Home Depot. The 3 bulbs I purchased were less than 30 dollars total, and you might not need that many. I put the 40 watt bulbs into a standard ceiling outlet and the 25 watt bulb is in a portable goose neck lamp. 6. Keep your thermostat around 65° F (18.3° C) give or take a few degrees. Warmer temps help create the breeding ground for plant diseases and pests. Moisture is the accomplice of both plant disease and fungus gnats. It’s OK if your plants dry out a little…especially since fungus gnat larvae can’t survive in dry soil. All containers should also have adequate drainage. I use a clip-on oscillating fan when I first bring in tropical plants. Why? To prevent overly humid conditions where pests can potentially thrive. Some might say this is counterintuitive to plant health, but I’d rather deal with dryer conditions than bug infestations. Once the threat-level is safely at green, the fan is removed. Last winter we didn’t use a fan and had no issues with fungus gnats. I believe the key to success is treating butterfly plants with the h202 mix (tip number 4) early to stop the infestation before it begins. If you see aphids on milkweed or other plants, stop them before they become an issue by trying idea #1, #3, #8 or #9 from this post. We’ve also sprayed isopropyl alcohol on plant leaves to kill off white flies and spider mites. I used to water once a week, but discovered this was too much water for some plants. Water a plant when the top couple inches of soil start to look and feel noticeably dry. 11. Going Away on a Long Trip? Plants go through an adjustment period when being moved outdoors and should not be placed in full sun to avoid scorching the leaves. 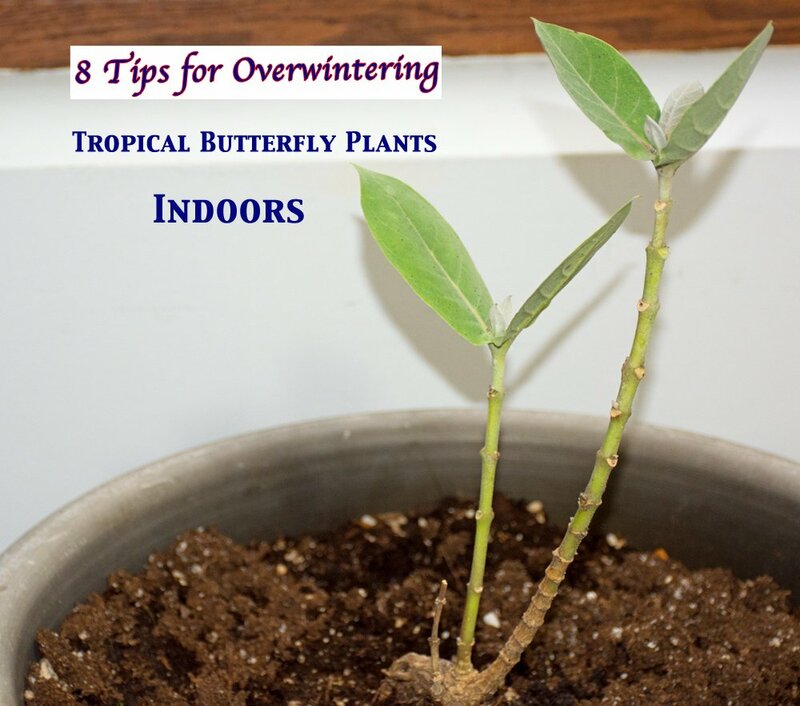 Expose overwintered plants to sun gradually over a few weeks. 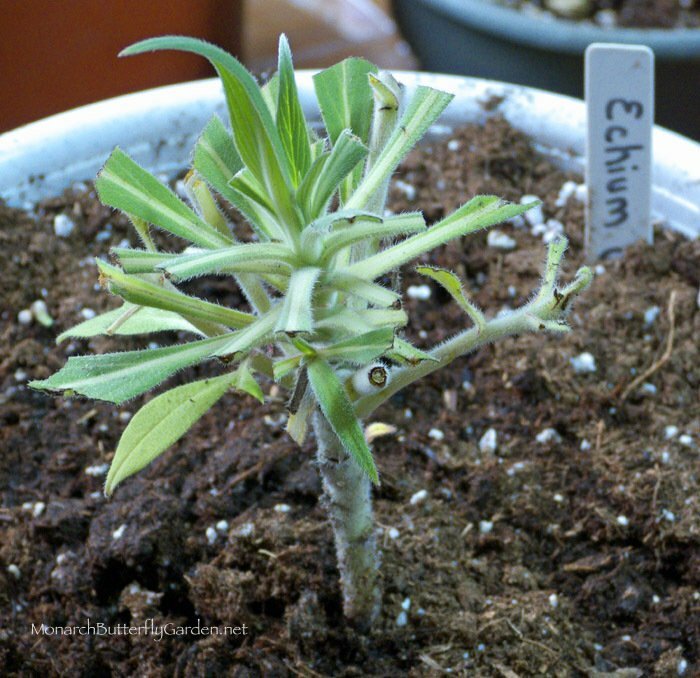 If overwintering Asclepias curassavica, take stem cuttings in early spring to start new tropical milkweed plants. If your intention is to use tropical milkweed for spring monarchs, take stem cuttings earlier in fall or winter. Regardless of your set up, some plants will do better than others and there will be trial and error involved. Be prepared to lose a few plants along the way, but hopefully you will learn what works through this experience. Which tropical butterfly plants could you take in for the winter? I’m in Michigan, zone 6a. I’m a little wary about over-wintering because I have 3 (kitty) cats that will chew on anything and I hear milkweed could make them sick. My alternate plan is harvesting some seeds in the fall which I’ve already done, stratifying them in February, then germinating them very early in March for transplanting outside mid April after the frost danger is over. I have a greenhouse in my backyard which should allow me to pull this off. I’ll report back on whether or not I’m successful with this method. I think the native milkweed will be OK with it but I don’t know if the tropical variety (curassavica) can handle it. February and March are cold here but the greenhouse is typically 25-30 degrees warmer than the outside air. I’m hoping this is a viable alternative for those who have pets and have room for a greenhouse in their yard but I haven’t proven it yet as a reliable alternative. I’m anxious to see if it works next spring. Best article ever! Thanks. You answered all my questions. Do you know about turtlehead? will that survive the winter outside near Madison, WI? This is the first year I’ve had it. Say – I bought your download book. You should publish it. I always forget to read my ibooks! Hi Diane, glad you liked the article…yes, turtlehead is a perennial. We have some planted in our shade garden that comes back every year in Minnesota. Hi Tony! 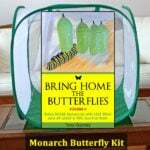 I don’t have a specific question at the moment, but I have stopped by your site a few times in recent weeks while raising Monarchs in central Florida (Orlando) and releasing them. I just wanted to leave a comment that I am happy to say I have helped contribute to the Monarch population this fall with 14 successful Monarch releases…all lovingly cared for and supervised by me since about mid-October! We have released 9 healthy females and 5 healthy males so far! I have 2 more caterpillars that are soon to become a chrysalis. The weather isn’t still pretty same here, with only a recent dip in evening temps for about a week…I brought the chrysalises and cats indoors during this time. I am intrigued about the entire migration process that these beauties apparently go through. Monarchs tend to be here year-round because of the tropical climate here. So, I’m not really sure if these last generation Monarchs for this season will actually participate in the migration, but here’s hoping that 2017 will see an overall increase in Monarchs! Thank you for this website. i live in south louisiana and am still in the monarch business!!!! 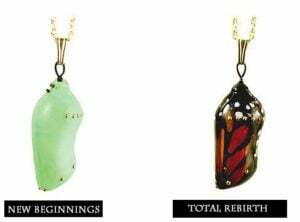 actually i have 81 chrysalis here, releasing 4 today, and have about 25 caterpillars left to go. don’t know why but still finding eggs and smaller cats on my plants. my yard is butterfly, bee, and bird friendly and have a lot of milkweed in quite a few areas. i should have counted since this was my first year for raising them with the cube, etc. but i know at the end, i will have had at least 250-300 monarchs, 30-50 queens, and had quite a few swallowtails that evolved outside. Really became a job rather than a hobby, which i didn’t mind. i even had a pet sitter that sat for them as well, now is doing her own. Thank you for all the info. on Mexican Flame Vine. When you root stem cuttings from MFV do you keep them in water all winter or transfer them to soil after they root? How do you get the water roots to adapt to soil? Hi Patricia, we’ve never had any issue with water roots adapting to soil. You can also root directly in soil. Mexican flame vine is very easy to propagate with cuttings. Thanks Tony! Yes, they are fine. Unfortunately I have 2 cats that will chew on or eat any plants in my house. I have beautiful flowers in my garden but since they are toxic I have to enjoy them outside. I just want to warn anyone with cats that decide to bring milkweed plants indoors. 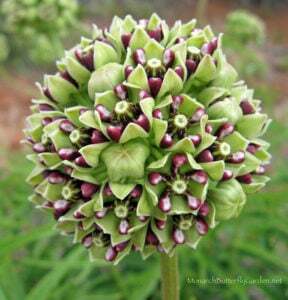 Milkweed is toxic to cats. I spent 450.00 at the vet after my two cats ate some milkweed that I carelessly left lying on the counter for just a few minutes. If you bring milkweed plants indoors make sure it is placed where your pets cannot eat it. Tony, I live in northeast Florida . I have had many bugs this summer on my tropical milkweeds and have had lots of plants die. Would it help to spray/water with peroxide even if I don’t bring plants inside? I live near Detroit & tho I grew up in an area full of milkweed, I haven’t had any luck growing the suckers! Last year, a single plant finally showed up (in my azalea of all places), after 20 years of trying!!! I have no idea what I did wrong. I bought Tropical, Cinderella, & Spider seeds last winter and again had trouble. After the ridiculous cold moist stratification for the Spider and the easier one for the Cinderella, I tried the winter sowing for the Butterfly Weed & that actually worked; amazing. Some of those actually grew well & I’ve tried them before to no avail. I’m going to do a lot more winter sowing this year. I was excited about the “fast growing” Tropical plants, & had a bunch started but they didn’t grow well & the few I did get just NOW started blooming! In late September? Omg! I’m a very good gardener, but what the heck is going on here? Out of 20 seeds of the Spider, I got 5 plants & left them in pots so as to bring them inside & not risk losing them. They are still tiny. The Cinderella- I got one from 50! That one is a modest 18″ tall but looks healthy. I dug up the Tropical ones & potted them just today being very careful to go far out of the drip line & Deep to catch all of the roots (or as much as possible). After watering, they look to be perking up. The Spider Plants we’ll have to see if I can get any of them to make it overwinter. I saw a lot more Monarchs this year than I have in many years, so they saw the Milkweed but got no caterpillars (they probably wouldn’t have done well considering the sparseness of my patches; I planted them in 3 different areas in the ground plus the pots). The rest of my gardens are Cottage type & have always had butterfly & hummingbird flowers. I don’t understand my difficulties with every single Milkweed type unless it’s the neighbors black walnut trees, but my neighbors I found last year have native Milkweed growing near the trees & never had trouble. My one neighbor said she has to aggressively thin her Milkweed patch as it’s always trying to take over, so I just don’t know what’s going on here. hmmmm. could the soil need amending with compost? Are you sure the seeds were viable? As for tropical in northern regions, you’ll have more success starting with stem cuttings or plants. spider milkweed has been hardy outdoors in Minnesota, so hopefully it will come back for you next season. Thanks. I did buy a lot of seeds from the same source last winter & more than just the milkweed seeds had trouble germinating. Many of the plants just were stunted & small all year even though I put them in the right spot & yes, the soil was amended. The pots were all cleaned prior to adding new potting soil & the seeds had the peat pellets, then I took the plants out & put them in seed starting mix since they weren’t thriving & we’re so tiny. I just had a really rough time. I don’t bring in perennials but I’m so scared of losing those Spiders & the one Cinderella, I just don’t know what to do. I’m afraid since the only one doing halfway decent is the Cinderella, I’ll lose all of them. They are that bad. We did have a horrible spring; usually we can start hardening off at the beginning of May & plant on Memorial weekend (some are ok for Mother’s Day, but we have to be careful). This year, they weather was so bad I was putting them in & out the whole month of May since the plants just wouldn’t grow! Even once June hit & it took me all the way thru to the 4th to finish dye to my Disability, the plants just didn’t thrive. I’m not just talking Milkweed now, either. Some were really easy ones like sunflowers! My dahlia still hasn’t bloomed & it’s up against the house on the south wall! It’s just been a bizarre summer. So, what do I do to propagate those Spiders & the Cinderella? Take cuttings & hope, try & over-winter, or just find a new source of seeds & start all over? Same?? with the Tropicals that just started flowering? Hi Judi, if you are concerned they won’t make it, you could put some leaf mulch around them right before your first big snow storm. Personally, I would not bring them inside. You could always fall plant some additional seeds to increase the size of your patch for next year. Do I use the hydrogen peroxide charts for watering overwinter newly rooted tropical milkweed cuttings to kill off some flying bugs that have appeared in my 20 oz. cups. I used a potting mix from Miracle-gro “Organic Choice” to start them in. I’m using distilled water to water them now and only put two cuttings together per 20 oz. cup. Hi Wayne, hydrogen peroxide kills the eggs that fungus gnats deposit in the soil. I water with hydrogen peroxide most of the winter because it keeps infestations from occurring and is also good for root health. good luck! I’m in SE Michigan & zone 6 – my plants have been indoors for weeks. Your article would have been more helpful a month ago at least. Hi Judi, I’m in zone 5 (Minnesota) and our overwintering plants are still outdoors. We usually bring plants indoors mid to late October. This warm fall, they’ll be outside into November. Could you go over how you overwinter the Mexican Flame Vine plant? I think you said you cut the root ball? 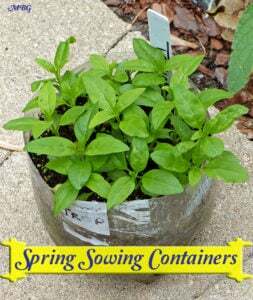 I have one planted in a 15″ container. How much root should I cut and how far down to cut the plant? Can I overwinter swamp milkweed in the garage? Thank you for the info. Will the insecticidal soap hurt cats if they are on the plants in the future and is there a specific soap I should look for. Hi Tony, thank you so much for this information. I have never even heard of a thrip but man can they do some damage. Have you ever had a problem with thrips on milkweed before? I have tropical milkweed leaves dying, brown spots (poo) on leaves, little bugs about 1/16 of an inch long. These plants are inside my office grow room combo. I also think I have fungus gnats out the wazoo too. Any suggestions? Hi Dan, I would treat the soil with 3% hydrogen peroxide. Use about a cup per gallon of water. This won’t do anything to the adults (which have a short life span) but will destroy eggs/larvae in the soil. If you have thrips try using an insecticidal soap. Good luck! Hi Doreen, I’m in zone 5a and still fall planting a few plants this week. I would definitely plant perennials outdoors now. Then in November, when the ground starts to freeze you can add leaf mulch for some extra protection. Good luck! I live in Orange County Ca. and have tropical milkweed growing in my garden and something keeps eating the leaves right off the plants. It has happened 3 times in the last few months. They get a new set of leaves and the are stripped right off. I see no bug infestation on them. We have a lizard and a squirrel in the garden. But I thought the milkweed was toxic to most critters. Any help would be welcome. Hi Tricia, some lizard species eat monarchs, so it wouldn’t be out of the realm of possibility for them to ear milkweed. I also saw a video of some type of mouse (in Arizona) that was eating tropical milkweed. Monarchs have many predators, so it would seem many have adapted to milkweed toxicity levels. We have lots of squirrels in Minnesota, but never seen one near the milkweed. Perhaps you could also try potting some plants and putting them in a harder to access location? Good luck! PS…the Arizona gardener discovered the mouse eating milkweed with a night vision camera. Interesting NYTimes article which makes me think twice about tropical milkweed. I have planted many seeds of natives; but still have lots of cuttings which are rooting beautifully. I don’t want to be responsible for OE in my little guys…. Hi Jennifer, increased OE spores are the result of overused milkweed plants. This is a concern for those living in warm weather regions where tropical milkweed doesn’t die back during winter. If you live in one of these regions, cut back your milkweed plants once or twice a year to allow healthy new growth to emerge. congrats on your 40 releases! Hi Kathy, I only use hydrogen peroxide when overwintering plants. It also kills disease spores on plants, but I’ve never been able to confirm whether it kills OE spores or not. What I can tell you is that it promotes healthy root growth and none of my indoor plants have had any funguses since I started using it. I would not use it while you are hosting monarch caterpillars. I don’t know if there would be any harmful effects, but I’ll assume it would not be healthy for them to ingest a large quantity of it. Do you spray the plants all winter, or just when you’re sure the bugs are gone? I don’t remember reading this in the article. Since I am new to raising Monarchs, I so appreciate your information! Hi Paula, I spray and water with the hydrogen peroxide mix all winter, since it’s also good for plant health. Will the Hydrogen Peroxide hurt butterfly larva or Cats that are eating the milkweed? I live in Florida, and the Monarchs are still laying eggs here. I’ll have to remember that peroxide trick. I don’t have any tropical milkweeds now, but may look for some next year as my milkweed garden will be expanding—that’s the good news (for butterflies). The bad news is, my garden will be expanding because EAB killed my large ash tree and I’ve been spending the past couple weeks cutting it down 🙁 LOTS of sunshine for the back yard now. wow Steve, we have a big ash tree in our back yard too and have been doing preventative injections for it. There wouldn’t be much shade in our yard if it ever went down. Not sure if that would be a good or bad thing. I hope your situation works out for the best! What size pots do you use for the curassavica? Did you wind up finding rooted cuttings or digging up full size plants and repotting to be easiest? Hi Haylee, we keep the tropical milkweed in 10″ to 12″ diameter pots. I usually bring in 2 or 3 plants and take cuttings from them in late February or March. If you want full sized plants to start the season, you could try taking fall cuttings outside and planting them in pots over winter. You can either start them in water or by using rooting hormone and plating in soil. Hey thank you for sharing this tip. Wintering is really a great issue as far as bulbs are concerned because all the bulbs are not capable of tolerating excess amount of cold they need some amount of heat. Hi Gracey, thanks for the tip. The hydrogen peroxide misting even got rid of the sowbugs that usually come in as well and no gnats so far great tip on the hydrogen peroxide spray. What ratio of water to hydrogen peroxide do you use to spray with as I also have had bad infestations of gnats as well in previous years. I am applying it according to this chart. I am using the “sick and fungusy” chart currently even though I don’t have an issue. I am spraying the leaves every other day and watering when the top layer of soil gets dry.